Since the mid-nineties, the “reimagining” of classic (and not-so-classic) television shows as feature film events has been a spotty and questionable trend. For every spectacular The Fugitive or amusing Brady Bunch Movie, we’ve been subjected to a plethora of sub-human atrocities such as Scooby-Doo, Flintstones or Car 54, Where Are You?. However, being less than intimately familiar with the source material, none of these films touched me on a deeper level. I could never throw on my fanboy hat and passionately champion or deride them for how successful they were in manipulating beloved memories of my past. Until now, at least. Get Smart was a weekly ritual for my good friend David and I during the latter years of elementary school. The assorted misadventures of bumbling Maxwell Smart ( Don Adams) and mod-chic Agent 99 (Barbara Feldon), agents of CONTROL battling the sadistic forces of KAOS, were slyly hilarious hodgepodges of spy-movie satire and top-notch slapstick, which played directly to my juvenile tastes. Sadly though, Get Smart hasn’t had a particularly strong shelf life, and indeed seemed lost in the annals of TV’s golden days. 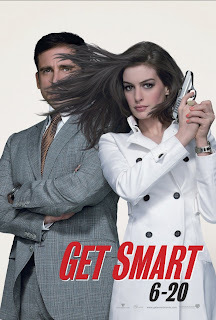 Or at least it was, until Warner Bros. decided to retrofit Get Smart into a multi-million dollar summer blockbuster. 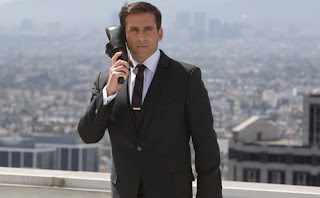 Get Smart Version 2.0 now features former-40-Year-Old Virgin Steve Carell donning Maxwell’s reliable shoe-phone. However, unlike the earlier incarnation, his Maxwell Smart is a lo t more competent this time around. When the film begins, he’s an ace CONTROL information analyst who dreams of being a field agent akin to the dashing Agent 23 (Dwayne “The Rock” Johnson). This fantasy is shattered, alas, by The Chief (Alan Arkin), who feels Smart is too valuable an asset to risk in the field. Nevertheless, after CONTROL is infiltrated and nearly destroyed by a KAOS mole, the hopeful agent is promoted and teamed with the alluring Agent 99 (Anne Hathaway), an experienced operative with little patience for Max’s over-zealous and seemingly clueless methods. Yet, as is usually the case, respect and attraction gradually blossom as the two become entrenched in the villainous plot, presided over by head-baddie Siegfried (Terence Stamp), and must work together to expose the mole and save the world from impending doom. Now, I am well aware that the majority of you wading through this review have little familiarity with the 60’s TV show. So, instead of succumbing to the temptations of un bridled geekiness, I’ll avoid going into torturous details regarding accuracy, and instead inform you that Get Smart, despite flashes of brilliance, is not the thriving success it deserves to be. There is a dual-personality at work here, that can’t decide whether to give emphasis to comedy or action, and lacks the confidence to truly commit to either. Director Peter Segal, the maestro behind films such as Tommy Boy, 50 First Dates and The Longest Yard, is competent, but the film cries out for a master’s deft touch. 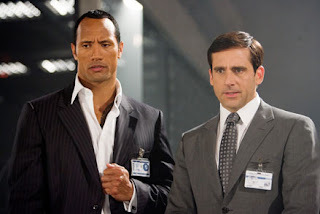 Steve Carell has been in some ill-fitting comedic roles as of late. In fact, his filmic output led to me creating a litmus test for judging his performances, as well as the strength of the script. He ten ds to have an unusual proclivity for screaming nonsensically in films that don’t give him enough comic material to work with. Hence in disasters like Evan Almighty he acted like a deranged mental patient who had managed to slip through the gates during puzzle time. Fortunately, the scream quotient is kept to a reasonable level in Get Smart, and Carell is actually an inspired casting choice. He understands how to deliver well-aimed zingers with a mix of understatement and sincerity, and his chemistry with Hathaway, who shows surprisingly strong comedic chops, is flawless. It’s a testament to their talents that they even make this flick’s dramatic moments feel genuine, when they are actually pretty hokey. The supporting cast, while nicely eclectic, is a little shakier. Dwayne Johnson gives probably his strongest performance to date, nicely immersing himself into the film’s zaniness. In addition, Alan Arkin is on fire, delivering the biggest laughs in the film. On the flip si de, villain Stamp is fairly lifeless, and comedians David Koechner and Terry Crews fail to add any zing to their “madcap” CONTROL field agents. James Caan, as the president, does a decent George W., but that parody exceeded its Best-Before-Date years ago. To be fair, Get Smart is extremely watchable. It’ll make a decent rental in a couple months. But as a reason to go to the movies, it doesn’t quite connect. The actors are dedicated, but the laughs aren’t consistent and the action set-pieces are unremarkable. This franchise has a lot of potential, and I hope the filmmakers work out the kinks in the inevitable sequel. Diehards and casual viewers will likely agree that Get Smart would benefit from being a whole lot, well, smarter. You know, you and I used to watch that show all the time, what... you're too good to mention watching tv shows with your sister??? HUH!!???!!!! Look lady, I don't know who you are but you're beginning to frighten me... My sister died in a fire at the old mill when I was 8. Your constant harrassments are unnearthing over a decade's worth of emotional scars.